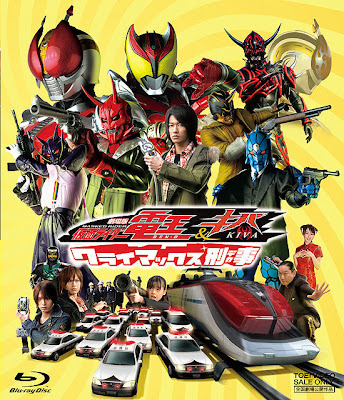 Set after the events of Kamen Rider Den-O, Ryoutaro and the Den-Liner gang have set up a detective agency called the Den-Liner Police (デンライナー署, Denrainā Sho?) who seek to keep the Imagin that survived the Junction Point in check after an Imagin stole a spare Den-O Pass from Owner while he was training. While pursuing the Pink Rabbit Imagin via car chase, they cross paths with the Horse Fangire as Den-O and the Tarōs battle them, killing the two monsters and not finding the Den-O Pass on either. Soon after, the Den-Liner Police are joined by detective Kazuya Suzuki, who tells them of an "Evil Organization" that is making itself known in the criminal underworld. After R-Ryotaro's "arrest spree", Ryotaro and Kazuya encounter Wataru Kurenai and Shizuka as they are suspiciously digging up items for a new violin varnish. After a small spat with U-Ryotaro and an unintentional possession of Wataru by Momotaros, Ryotaro and Kazuya locate the base of the Evil Organization after Wataru tips them off. There, before being chased out, they find Yuto with the organization's leader, the Imagin Negataros, and a man that Kazuya recognizes as wanted criminal Seiya Kuroki. Acting on his own, Kazuya attempts to arrest Kuroki, only to be ambushed by the Clown Imagin. However, with a drunk Deneb and Naomi as a distraction, Yuto, who has been working incognito, attempts to free Kazuya.